So. Burlington, VT – August 31, 2012: LPA Design, manufacturers of PocketWizard Photo Products, the world leader in wireless control of cameras, flash lighting and light meters, announces today the release of MiniTT1 and FlexTT5 for Canon 6.153 beta firmware with 5D Mark III compatibility. The beta firmware release notes and instructions on how to download the beta firmware can be found here. Please note that this beta firmware release for Canon does not include compatibility with the Canon EOS-1D X or the Rebel T4i. Learn more about our firmware development plan here. For convenience and reliability, we highly recommend that you apply this update directly from within Photoshop. To do so, choose Help > Updates in Photoshop CS6 and apply all of the updates listed under Adobe Photoshop CS6 in the Adobe Application Manager. This update applies to all languages of Adobe Photoshop CS6. The Adobe Photoshop 13.0.1 update includes many critical fixes improving security, stability and performance while also addressing a number of high priority bugs with 3D, Crop, Type, Painting, Paths, and Shapes. Canon is reinforcing its commitment to high levels of service with the announcement of an additional one-year warranty for its EOS-1D X, EOS-1D C, EOS C100, EOS C300, EOS C300 PL, EOS C500 and EOS C500 PL camera bodies, providing photographers and filmmakers with two years of warranty coverage in total, free of charge. The offer consists of a one-year extension on top of the one-year Standard European Warranty System (EWS), under identical terms and conditions, for a total warranty period of two years from the date of purchase (a proof of purchase and the one-year Standard European Warranty System will be required). The two-year warranty is valid on products originally distributed by Canon within the EU countries plus Lichtenstein, Norway and Switzerland. To be able to claim the additional year of warranty you must have purchased the product in one of these countries. For full details and terms and conditions you can download the warranty leaflet. With a length of 196 millimeters and weighing in at 2.5 kg (5.5lbs), the Compact Zoom CZ.2 28-80/T2.9 is sleek and lean. Thanks to the five different mounts (PL, EF, F, MFT and E), this new zoom lens from Carl Zeiss can be easily adapted to numerous camera systems both now and in the future, as well as on HDSLR cameras, HD video cameras and professional cine cameras. With its slim build, the Compact Zoom family follows the current market trend towards smaller and lighter lenses that are perfect for handheld cameras, Steadicam systems, or for shooting in tight spaces. The Compact Zoom CZ.2 is espe- cially comfortable to use thanks to its ergonomi- cally designed and partly rubber-coated surface, which allows both precise manual focusing as well as mechanical focusing via follow-focus systems. The Carl Zeiss T* anti-reflective coating ensures maximum contrast and color rendition by minimizing stray light and ghosting within the lens. The Compact Zoom CZ.2 lenses delivers flare- free results and has no focus shift over the whole zoom range. During the IBC, Carl Zeiss will display in a huge glass case all of its camera lenses that are currently available on the market — lenses that guarantee images of the highest quality, whether used on Hollywood movie cameras, HDSLR or HD video cameras. The Compact Zoom CZ.2 28-80/T2.9 will be delivered in the second quarter of 2013. The recommended retail price is €14,900 or US$19,900 (excluding VAT)*. Get your Zeiss Lenses at Adorama. 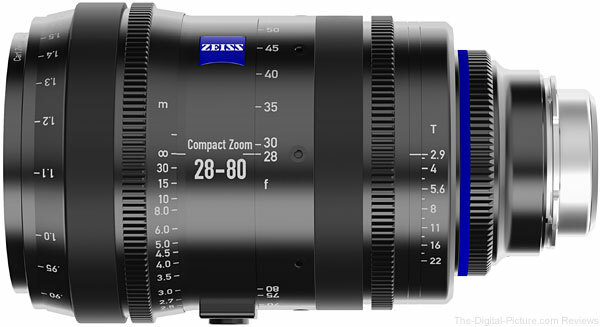 Carl Zeiss will present a new cine lens from the Compact Prime CP.2 lens family during the IBC 2012 in Amsterdam, the leading international trade show for film, radio and television, from September 7 to 11, 2012, in hall 11 booth G64. With an even larger aperture, the new Compact Prime CP.2 25/T2.1 lens from Carl Zeiss achieves outstanding images in challenging lighting conditions. The Compact Prime CP.2 25/T2.1 succeeds the Compact Prime CP.2 25/T2.9, which will continue to be available as long as supplies last. “We are responding to the wish of many cinematographers and video producers who would like a high-speed CP.2 lens with a maximum aperture of T2.1 for the 25mm focal length range as well,” says Anna Rausch, Product Manager Cine Lenses in the Camera Lens Division of Carl Zeiss AG. “Our optical experts have virtually eliminated the chromatic aberrations on these lenses through a special design and selection of materials. We can now offer a constant max T-Stop of 2.1 for all of our CP.2 lenses in the focal length range of 25-135mm.” This gives users even more possibi- lities to compose their images and requires less effort with the lighting. The biggest advantage on set is that the light does not have to be adapted when switching lenses because they all have the same F-Stop. The lens speed is ideal for playing with the depth-of-field. The Compact Prime CP.2 lens series, extremely popular among ambitious cinematographers thanks to its 14 fixed focal lengths from 15 to 135mm, will again be the center of attention during Carl Zeiss's presence at the IBC 2012. By using the interchangeable mounts for PL, EF, F, MFT and E, the lenses can be easily adapted to numerous camera systems, ensuring compati- bility with future cameras as technology changes. Thanks to the interchangeable mounts and the 36 x 24mm image-circle illumination the Compact Prime CP.2 lens family is versatile to use — on HDSLR and HD video cameras as well as on professional cine cameras. The lenses are characterized by their robustness, a standard focus rotation angle of 300 degrees and uniform measurements. This combination makes the lenses ideally suited for every demand on the film set. All Compact Prime CP.2 lenses have a standard cine-style housing with gearing that allows the attachment of any standard follow-focus system. All the new features that Carl Zeiss presented at the NAB Show in Las Vegas in April will now enjoy a European debut at the IBC 2012: two Compact Prime CP.2 lenses (CP.2 15/T2.9 and CP.2 135/T2.1), three Compact Prime CP.2 Super Speed lenses as well as the Compact Zoom CZ.2 70-200/T2.9. The new focal lengths 15mm and 135mm expand the offering of the Compact Prime CP.2 family and open up many new creative possi- bilities, from super wide angle to tele. The three Compact Prime CP.2 Super Speed lenses have an aperture of T1.5 and are available in focal lengths 35mm, 50mm and 85mm. These high- lights as well as other cine and camera lenses can be experienced and tried out on the spot during the IBC. Alongside the new features, Carl Zeiss will display behind a huge glass case all of its cine and camera lenses that are currently available on the market — lenses that guarantee images of the highest quality, regardless of whether they are used on cameras to shoot Hollywood movies, on HDSLR cameras or HD video cameras. The dis- play will include the well-known Master Prime, Ultra Prime, Compact Prime CP.2 and Compact Zoom CZ.2, DigiPrime, Lightweight Zoom LWZ.2 lenses, as well as SLR camera lenses, which are ideal for getting started in the HD video segment. In addition, Carl Zeiss and its partner ARRI will present the long-awaited anamorphic lens to public. Visitors to the Carl Zeiss stand will have an opportunity to try out a prototype of the lens that is currently in the final design phase on an ARRI Alexa Studio camera. 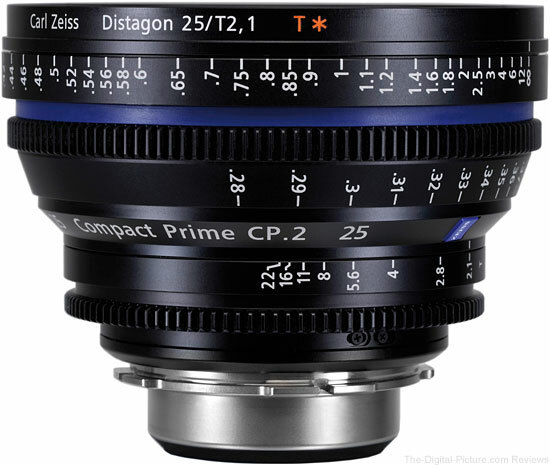 Carl Zeiss will start shipping the new Compact Prime CP.2 25/T2.1 on October 1st, 2012. The expected retail price is EUR 3,300 (excl. VAT) or US$ 4,500 (excl. VAT)*. North White Plains, NY (August 27, 2012) – Profoto, the world's leading manufacturer of lighting solutions for still and motion photography, announces today the new Pro Plus line of flash heads. The new safety lamp head connector is the most visible upgrade. The safety lamp head connector helps prevent dust and moisture from penetrating the generator. Note that the safety lamp head connector is 100% backward compatible. The stand adaptor has been upgraded with a fixed screw. Unlike the previous version, it cannot be unintentionally screwed off. In addition, the stand adaptor is now equipped with an additional hole, which creates improved mounting options. The “Perfect Arc” flashtube has a new design that vastly improves the triggering capabilities on low power settings. This also provides better color and energy stability from flash to flash on all power settings. Note that the new flash tube is compatible with all previous generations of ProHead and Pro-7 Head. The glass cover has been made thicker, which makes it even more robust and safe to work with. ProRing Plus and ProRing 2 Plus have been updated with the new safety lamp head connector. Get your Profoto gear at Adorama. North White Plains, NY (August 27, 2012) – Profoto, the world's leading manufacturer of lighting solutions for still and motion photography, announces today the sturdy new Pro-B4 1000 Air featuring ground-breaking flash duration. Thanks to the new, patent pending Hybrid Capacitor Technology, the Pro-B4 delivers flash durations down to 1/25,000 of a second – making it not only the shortest flash duration of any battery generator in the world, but also of any flash pack. In addition to its short flash duration, the Pro-B4 is also the world’s fastest recycling battery generator. At lower power settings it is capable of firing up to 30 flashes per second, while the longest wait on full power is less than a second. Featuring two independent outlets with individual controls and displays, the new Pro-B4 makes it as easy as possible for photographers to take full advantage of all features. The unit’s energy setting can be adjusted quickly with precise control in 1/10 f-stop increments. The unit’s display can be set to show the output in f-stops or watt seconds, and information about the flash duration on each head is easily accessible. The Pro-B4’s powerful Li-Ion battery can fully recharge in less than 45 minutes and can be recharged while in use. This means that if the modeling light is used moderately, the pack can be used continuously while connected to a main outlet. In addition, the battery can be recharged just as fast with Profoto’s portable power source, the Profoto BatPac. Finally, the Pro-B4 is the most durable battery generator on the market. The solid-cast aluminum chassis and the sturdy rubber frame ensure that it can take rough handling. All connections have protective lids and the pack has no air vents to help prevent water or dust from getting inside. With the release of version 7.5.4, DxO Optics Pro now supports the Pentax K-30 and Sony DSC-RX100 and adds more than 400 new camera/lens combinations since the prior version - surpassing the 8,000 Optics Module mark. Find DxO Optics Pro at Adorama. Canon has announced that it plans to introduce the EF 14mm T3.1 and 135mm T2.2 Cinema Prime Lenses in the first half of 2013. ISO 12233 Chart results have been added to the Canon EF-S 18-135mm f/3.5-5.6 IS STM Lens Review page. This lens is sharper than its predecessor at the wide end. Here is a direct comparison between the Canon EF-S 18-135mm IS STM Lens and the older Canon EF-S 18-135mm IS Lens. Today, Corel announced the release of the new Pinnacle Studio software family, which includes: Pinnacle Studio™ 16, Pinnacle Studio 16 Plus, Pinnacle Studio 16 Ultimate and Pinnacle Studio for iPad. Based on award winning technology and inspired by the ease-of-use of previous versions, the new line offers a solution for every level of video editor. And with optimization for the latest CUDA GPUs, exclusive NVIDIA 3D Vision support, free cloud file sharing and storage with Box, and a fresh user interface, Pinnacle Studio 16 is the most innovative version to date. Modern, fast, and easy, Pinnacle Studio 16 helps everyone tell their story with style. Pinnacle’s partnership with NVIDIA allows exclusive NVIDIA 3D Vision support on Quadro graphics cards and on NVIDIA’s GeForce consumer line as well. Users can now edit and preview their 3D work in both full-screen and window modes - something no other editing application can do! In addition, Pinnacle Studio takes full advantage of the latest NVIDIA CUDA enabled graphics cards for an incredibly fast editing and rendering experience. “The Box and Pinnacle Studio 16 integration makes it incredibly simple for digital artists to access, edit and share their video content wherever the studio may take them,” said Chris Yeh, VP of Platform at Box. “Box’s open platform and the Pinnacle Studio software family will unlock new levels of innovation for creatives across the media and entertainment markets." Creating incredible movie memories in HD or 3D has never been faster and easier, thanks to Pinnacle Studio 16. Easily create amazing videos on the go with Pinnacle Studio for iPad. Users can start editing project on their iPad, then import into any Pinnacle Studio product on their PC for additional polishing. Pinnacle Studio 16, Pinnacle Studio 16 Plus and Pinnacle Studio 16 Ultimate are available in 17 languages and can be purchased immediately as an electronic download (ESD) from www.pinnaclesys.com or from Corel's global resellers. North American suggested retail pricing (SRP) of Pinnacle Studio 16 is $59.95, Pinnacle Studio 16 Plus $99.95 and Pinnacle Studio 16 Ultimate $129.95 (both US and CDN). Users of Pinnacle Studio 9 or higher, Avid Studio and Pinnacle/Avid Liquid 6 or higher are eligible for the following upgrade pricing: Upgrade to Pinnacle Studio 16 Plus: $69.95,upgrade to Pinnacle Studio 16 Ultimate: $89.95. For more information please visit www.pinnaclesys.com. The Pinnacle Studio 16 app for the iPad is available worldwide today from the App Store in English, German, French, Italian, Spanish, Japanese, Dutch, and Simplified Chinese. For more information, please visit www.pinnaclesys.com/studioapp. Order Pinnacle Studio at Adorama. Canon EOS-1D X Firmware Version 1.0.6 is now available for download. Firmware Version 1.0.6 incorporates the following fixes. Fixes a phenomenon in which the AF Microadjustment cannot be correctly carried out. Fixes a phenomenon such that when using the camera with combinations of certain lens *1) and extender *2) the images captured become back-focused. Fixes a phenomenon in which, when the camera is powered on in very dark environments (including instances when the lens cap or the body cap is attached), Error 80 appears on the camera. Fixes the following phenomenon: if two CF cards are inserted into the camera and the "Standard" or "Auto switch card" settings is selected for the recording method for [Record func+card/folder sel. ], and then one of the CF cards is removed and then reinserted into the card slot, the card selected for recording and playing back images may be switched to the other CF Card. Fixes a phenomenon in which the AF microadjustment value is not correctly displayed in the EXIF information of the images captured. Displays a "O" or "X" result to indicate whether images have been successfully transferred through the FTP protocol when using the FTP protocol when using the WFT-E6 Wireless File Transmitter. * The firmware update takes approximately seven minutes. Adobe has made release candidates available for Adobe Photoshop Lightroom 4.2 and Adobe Photoshop Camera Raw 7.2. Folder stacks with virtual copies get unstacked when moving to another folder. Stacked photos get hidden in both the Grid view and Filmstrip. This occurs when photos get unstacked as a result of enabling auto-stacking. Errors encountered when publishing videos to Facebook through the Facebook Publish Service. Users may have occurred problems when trying to enter the Web Module from Library. Unable to edit JPEG photos in Photoshop Elements. Unable to upload files to Flickr if there is a carriage return in either the Title or Caption fields (Win only). Background graphics that are applied to a Book globally may not appear as expected in a Saved PDF. Certain book covers had spine text positioned in a Horizontal manner, not Vertical. Double byte characters are not being exported to PDF in Books. Photos were exported with original GPS coordinates recorded by the camera, not with the GPS coordinates updated in Lightroom. Keyboard shortcuts in the Develop module sometimes do not work when editing an image in Process Version PV2010. Parents and synonyms of "do not export" keywords also do not export. Audio does not play in video files after creating a slideshow containing music (win7 only). Tether support not working for Nikon D4, D800 , and D800E (win only). Cannot change “Erase” size, feather and flow settings while utilizing the Option key. Cannot write metadata to images previously opened in some 3rd party software. Luminance Noise slider is unresponsive when Clarity is greater than 0. In certain cases, the new Defringe controls can cause vertical streaks to appear. Some images from Canon 5D Mark II exhibited pattern noise in the form of maze/green split artifacts. Adjusting the Blue channel does not affect monochrome images. Certain TIFF files can cause Bridge to become unstable. Defringe settings are not retained when editing the file in Photoshop as a Smart Object and then returning to ACR.